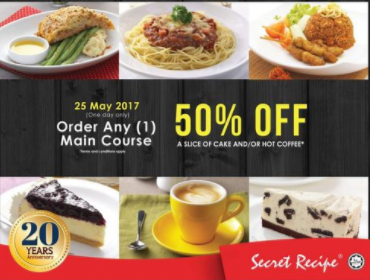 Secret Recipe Malaysia offers Slice of Cake 50% OFF and or hot / cold coffee with purchase any main course meal ordered in celebrating 20th anniversary at all outlets in Malaysia. Promotion Period: 25 May 2017. Venue: All Secret Recipe outlets in Malaysia.